As a life coach and a career coach, I’ve worked with many clients who’ve achieved their professional goals or won the coveted job, only to find themselves feeling restless and unfulfilled. Lacking purpose or meaning. Feeling a bit stuck. It’s all too easy to trudge up the ladder, chase the promotion or hastily take a position that isn’t going to challenge you six months down the road—whether out of fear or simply because it was offered. The problem is, your career is not separate from the rest of your life. It’s one important piece of it. That’s why a narrow focus on getting that promotion, landing the job or hitting the next expected career milestone can often backfire. If you want to energize your professional life and do more fulfilling work, you need to know how that work fits into the bigger picture of the life you want to build—and live. Here’s a five-step process to help you carve out more clarity on what you truly want, so that you can focus on finding the work that helps you achieve it. What are the themes of your ideal day? What types of things are you making time for and why? What’s truly important to you? What do you need, personally and professionally, to be at your best? Think about the jobs that did not fulfill you—what was lacking? When we spend the time to break this down, most of us know what is critically important to us and which values motivate us. Getting clear on this helps everything else fall into place. It becomes your litmus test for opportunities. Chances are, there are some gaps between your ideal day and your current workday. It’s time to identify those gaps and see what’s missing. To do this effectively, you’ll want to put aside everything you think about what you “should do” and remain focused on your ideal day and what matters to you. What’s lacking might be a work issue or a personal issue. It might be a combination of the two. Don’t worry about how to fix it, just be honest. Brainstorm all the changes you could make to fill the gaps. How could you build the next stage of your career (or business) to reflect what truly matters to you? Maybe your current role offers new opportunities to make new and different contributions that call on your strengths and interests. Maybe another industry offers more opportunity to work in a way that matches your ideal day. Maybe a job or role change is in order and maybe not. It might be time to set boundaries at work or at home to achieve a better sense of well-being. No idea is off limits. Now, you’re ready for some goal setting. Keeping in mind how you want to live and work, what you need, what matters most to you and the ideas you’ve had for getting there, set at least one new goal for your work life. Make it motivating. Make it a stretch. Then—and only then—are you ready to put your new plan into action. Start with your end in mind—the life you want to live and the contributions you want to make. The professional goals you set as a result will feel more aligned with who you are, more purposeful and more fulfilling when you reach them. 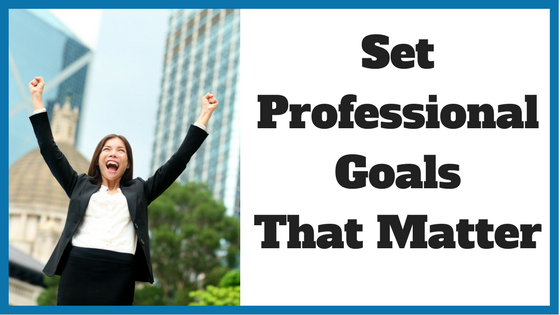 Need some help reaching your professional goals? Connect with Sally Anne Giedrys or browse our directory of career coaches and request a FREE consultation!